Two juvenile suspects face charges in beating and robbery of 74-year-old Yong Kim. An update on in this investigation out of Michigan... In Ann Arbor, police have identified two juvenile suspects in the brutal beating and robbery of a 74-year-old restaurant owner last week. 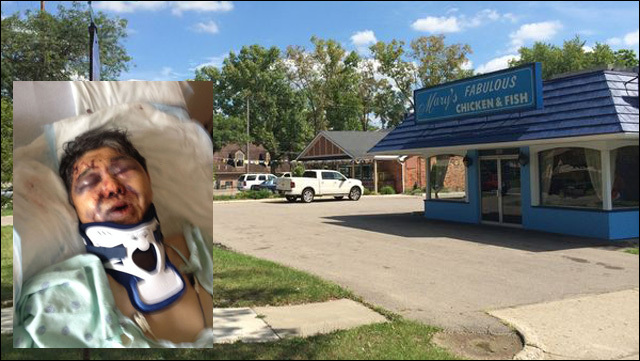 According to Ann Arbor police, they've identified the individuals responsible for the attack on Yong Kim, owner of Mary's Fabulous Chicken and Fish. Kim suffered several severe injuries on his head, neck and face, and robbed of his wallet, when he was attacked from behind in the parking lot outside his store. Ann Arbor police identified two juvenile suspects who could face charges in the robbery and beating of an Ann Arbor business owner last week. Ann Arbor police Detective Lt. Robert Pfannes said Tuesday morning one suspect would face a court hearing at 1:30 p.m. Tuesday where a juvenile petition would be filed. In juvenile court, that's the equivalent of an arraignment hearing in the adult courts. One other suspect's petition is under review by the Washtenaw County Prosecutor's Office, Pfannes said. "We've identified the individuals in that case and at least two juveniles will be facing review by the prosecutor's office," Pfannes said. Thankfully, Kim didn't suffer any brain injuries in the attack, and is now home from the hospital. Police are still looking for any witnesses to the attack. Anyone with information on the incident is encouraged to call the Ann Arbor police anonymous tip line at 734-794-6939 or Crime Stoppers at 1-800-773-2587.